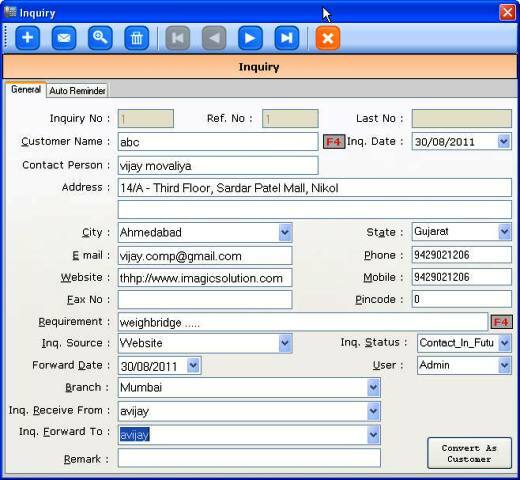 Imagic (Enquiry Management System), Managing your service business with Miracle Service can help you dramatically increase productivity and efficiency. It is designed to give small and medium sized companies the same high-powered features that bigger ones enjoy, but at a fraction of the price. The service management and the maintenance of history thus possible will improve the sales process of course. Additionally, it can help in incentives calculations. Customer relationships can improve too. Follow ups are always possible at correct and agreed times. You can attach relevant documents such as quotations, tender, excel sheets, documents for follow up etc. This way when you go looking at history, you do not need to go hunting to other documents all over your hard disk. Exporting data for mail merge is possible. That reduces a lot of burden for direct mailings. Data is backed up and restored regularly. Know where you are making money, by analyzing your service personnel performance, chargeable vs. non-chargeable jobs, work in progress, accounts receivable, etc. Reduce the risk of key people by using automated knowledge management. Keep the valuable tacit knowledge in your organization, and not just in the heads of your service personnel. Complete trailing of follow ups and deals with enquiries. Capture new sales leads uncovered by your service personnel and feed them quickly to your sales force. Any time review of the enquiry. This software manage Customer Inquiry / Quotation / factory work order. Follow up client as scheduled. Reminder Popup automatically next schedule to contact. After Register Complain send auto SMS to client same as after finished complain send SMS.